By May 1956, nearly everyone in the United States had heard of Elvis Presley. “Heartbreak Hotel” was #1 on Billboard’s pop chart for the entire month. He had appeared on the Dorsey Brothers’ network TV program early in the year and on The Milton Berle Show in April. Articles on Presley were appearing in dozens of national magazines, including Life and The Saturday Evening Post. By May, though, most people in the country were still unaware of the phenomenon that would become known as “Presleymania.” “Heartbreak Hotel” was a huge hit, but Elvis had yet to follow it up with a second popular record. His raucous version of “Hound Dog” on the Berle show was still a month away, and his appearances on The Ed Sullivan Show wouldn’t start until September. 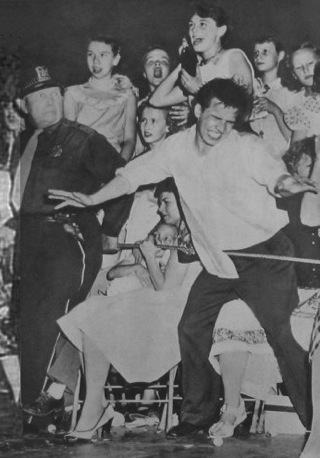 In the spring of 1956, then, to comprehend the pandemonium of “Presleymania” it had to be seen firsthand, and Elvis was working hard to raise the awareness of it in as many communities as possible. From May 13-27, 1956, Elvis worked in 17 cities without a day off during a 16-day tour of the Midwest. On May 20 he performed before two large crowds in Omaha, Nebraska. There was nothing unusual about his performances … a short 22-minute set opening with “Heartbreak Hotel” and closing with “Hound Dog.” The profound effect it had upon the community, however, was subsequently revealed in the pages of the city’s two daily newspapers. A photo printed in the Omaha Evening World-Herald (right) triggered a stream of letters-to-the-editor. Starting four days after Presley’s appearance, the World-Herald printed on its editorial page three batches of letters that exposed the rift in values between teenagers and their parents that Presley’s appearance had exposed. Reprinted below are the dozen Elvis letters published in the World-Herald in May 1956. As a group, they shed light on the struggle for the hearts and minds of young people in the pop culture of the mid-fifties. One wonders what to think when he contemplates the reactions of youth to an Elvis Presley as shown in The World-Herald picture. The expression on the police officer’s face was an interesting study. What did he think? That he should get out the handcuffs and strait-jacket? In the Middle Ages there was a dancing disease by the name of St. Vitus. People roamed from place to place, twitching and jerking, similar, it seems to these reactions. What is the cause of epidemic reactions of the nervous systems or minds of victims of such afflictions? Is it because youth is not subject to any serious requirements or duties beyond classroom requirements, much of which is of questionable value resulting in a complete lack of a sense of proportion or value? The expression on the policeman’s face is priceless. I can well imagine how he felt. This picture should win one of the “best newspaper pictures of the year” awards. I hope that the taste in teen-age hero worship will take a turn for the better by the time my two children reach that stage. I’ll go along with ’Lil Abner and “Fearless Fosdick” as “mah ideel.” We’ve gotten more fun from the publicity on Elvis the past few days than from the comics. What’s happened to our teen-agers? Are their morals and standards so low that they have to watch this Elvis Presley perform his downright immoral and filthy actions? If these youngsters would go to church and show as much feeling toward their Creator maybe they wouldn’t be so mixed up. Why is it that our official leadership can’t figure out why there is so much wrongdoing by our teen-agers when the answer is so plain—a young man who by his actions can throw a girl into such frenzy as to impel her to rip off her clothes? We paid $10 for four seats on the main floor. We thought we were going to see and hear a good show, but were disappointed in both respects because the teen-age girls squealed like pigs being driven to slaughter. Elvis Presley is a degrading entertainer with his gyrations and cooch dancing. If the show were “filthy and indecent” I am sure the police would have stopped it. Let’s face it. He’s not much different from any other teen-agers’ heroes. The lady who paid $10 for four seats should have been aware that she was not going to a solemn concert for the rocking chair crowd. —G. L. D. | Columbus, Neb. I was one of the lucky persons who met Elvis Presley following his Omaha performance. “Omaha is a fine town and I would like very much to come back some day,” he said. He also got a kick out of the squealing. Any person who bought a ticket should have known what he was in for. A lot of people would go through his antics and cooch dancing if they were making a million dollars like he is. I want to thank police for keeping as much order as they did at the Elvis Presley show. The screaming of the audience, which cut down hearing the music, and the pushing and shoving, I learned later, were the same reaction that Elvis has been receiving all along the line. Elvis and his band members agreed that this was one of the most orderly performances they’ve played in the last three months. I would like parents to know that Elvis is a wonderful person to meet. He’s just a normal American youth. First half of the show was O.K., but the minute Presley stepped on stage it was pandemonium. I couldn’t see anything except the kids standing on their chairs. The uproar was such that I couldn’t hear the music. It cost me $2.50 for a headache. Next time the show should be stopped until everybody stays seated. I am really burned up at the letters concerning Elvis Presley. 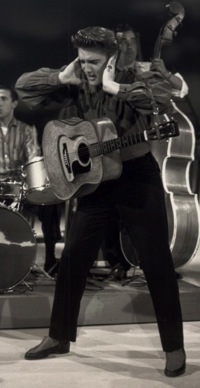 His performance was referred to as “downright immoral with filthy actions.” Presley’s atomic powered delivery should not be censured any more than Frankie Lane’s energetic style or Johnny Ray’s “wail.” Elvis Presley is just another explosive singer whose individuality is causing a great commotion. It is stupidity to link him with juvenile misbehavior. —V. Gard | Kearney, Neb. One of the Elvis Presley letters stated that teen-agers should go to church and show respect for our Creator. Another suggested that we were lazy and degenerate because we didn’t do anything after school hours and during the summer. We didn’t ask to be created, least of all into the turmoil of the present day world. As to being lazy and shiftless, may I remind that jobs are very scarce. Automation and highly efficient machines have driven our parents out of work—yet we are expected to get jobs. Teen-agers chose Presley because this day and age could offer them no better. He is a clean entertainer. I protest your publication of the pictures and story of the Elvis Presley performance. I became ill and nauseated. I am still unsettled and queasy. There are new drugs on the market called tranquilizers. According to Newsweek, they made a well monkey calm and tranquil. Perhaps they might help Presley and his admirers. We thought Presley’s movements weren’t the best, not the worst, either. We attend church and know right from wrong. We also know that the Bible has nothing to do with Elvis Presley … Some of the parents should remember back to their heart-throbs. "I protest your publication of the pictures and story of the Elvis Presley performance. I became ill and nauseated. I am still unsettled and queasy. There are new drugs on the market called tranquilizers. According to Newsweek, they made a well monkey calm and tranquil. Perhaps they might help Presley and his admirers."